Is the Gap Theory a biblical teaching or just bad translation? Nathan Jones: We have Dr. David R. Reagan here, but there is a Dr. David F. Reagan out there who believes in the Gap Theory. People are always getting the Dr. Reagan's mixed up. Can you explain the Gap Theory for people so they know that we here at Lamb & Lion Ministries do not believe in the Gap Theory. Please tell us what the Gap Theory is and what are the verses it applies to. Dr. Reagan: I want to say that again — I do not believe in the Gap Theory. I've never believed in the Gap Theory. So, Mike, tell us about the Gap Theory. Mike Riddle: First of all, let me explain what the Gap Theory is and why it got invented. In the 1800's, people started believing that the earth was old and that was in part from what Charles Darwin brought about. The earth has to be old to accommodate the whole idea and philosophy of Evolutionism. A lot of our theologians started to cave in by that point and declared, "Well, if they've proven the earth to be billions of years old, where are we going to put this time into the Bible?" They decided to invent something called a gap to explain the long geologic ages in the fossil record. They put a gap in between Genesis 1:1 and Genesis 1:2. These verses read, "In the beginning God created the heavens and the earth and the earth was without form and void." What these confused theologians did in between those two verses was to put a gap of time of millions of years to accommodate the geologic time. To do this they reworded the Bible just a little bit so that it says, "In the beginning God created the heavens and the earth and the earth became (not was) without form and void." In other words, the rewording gave the indication that God created the earth and then something happened before the rest of creation was completed. There are a lot of different versions to what this something could be. Some say it had to be Satan's fall which then made a flood which destroyed everything. The earth then became without form and void. We have to look at the word "became" which is the verb hayah in Hebrew. Can it mean became? Yes it can, but only in very specific cases, and only when hayah is proceeded by a preposition. In this case it is not proceeded by a preposition, so using "become" is an incorrect translation to translate that verb "became" rather than "was". Another text these Gap Theorists use is in the King James, and that's the word "replenish" from Genesis 1:28. God told the people to go and "replenish" gives the indication that something went wrong and people have to refill the earth. We have to understand the King James is not wrong there. We have to understand that when the King James Bible was written the word "replenish" meant "to fill," not "refill." so we have to have a little study in grammar here. After the King James Bible was written that verb underwent a definition change. Today it means "to refill." So, to translate that correctly in modern English we should use "fill" instead of "replenish." There are other problems with the Gap Theory. For instance, if we put the long geologic ages with the fossil record between Genesis 1:1 and Genesis 1:2 the problem here is, what was going on during that gap? Death, decay, and disease. The Gap Theory clearly teaches death before sin, and the Bible teaches death after sin (Rom. 5:12). Dr. Reagan: How does someone like Hugh Ross handle this question? 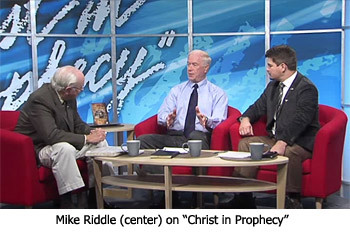 Mike Riddle: Hugh Ross' ministry will say that when it comes to sin the Bible's just referring to human death. Romans 5:12 does refer to just human death. But, he forgets Romans 8:22 where it says, "all of creation groans," which includes everything including the animals all because of one man's sin. So, he misses that point. Or, he'll come up and say, "There had to be death before sin. Plants were dying. What were Adam and Eve eating from? Plants. What happens when you dig up plants and eat them? We kill them." He forgets a very important point there. God gave the breath of life to humans, and He also gives life to the animals. But, nowhere in the Bible does God give the breath of life to plants. Plants biologically have life because they have a cell structure, but biblically they are not given life. So, there really is no death before sin found anywhere in the Bible, and therefore no gap between Genesis 1 and 2. Dr. Reagan: So, the theologians who can't accept a young earth have got to come up with another theory? Mike Riddle: Right, and unfortunately they in the process discredit the authority of God's Word. They are also not using good science in doing that because good science does indeed support a very young earth. Dr. Reagan: Yes, and so does the statement concerning the Sabbath in the Ten Commandments where you earlier pointed out it says a day is a day. Mike Riddle: Here's another one. Did you know Jesus Christ Himself believed in a young earth? In Mark 10:6, Jesus makes this statement, "But from the beginning of the creation God made them male and female." What is Jesus saying here? Man and woman were on this planet from the beginning of the Creation, and not after millions of years. There's Jesus Christ our Lord and Savior and the eyewitness Creator to all things proclaiming the earth is young. In the sixth segment of this Creation training series with Mike Riddle, he'll give us the strongest arguments against Evolution. I heard Benny hinn preach this in the 90's and for a time I believed it . Then I just decided by reading the bible that it wasn't true. It is so hard to know what to trust as true even in our bibles. Example the Lord's Prayer didn't end the way I was taught in church. I hope God looks at our hearts and not our heads when we stand in judgement. I for one am so discouraged thank you for your truth here. What gap theory people don't get is that the phrase " In the beginning God created the heaven and the earth" is a independent clause. Also Exodus 20:11 says "six days". Any time a number and/or the phrase evening and morning are put with the word day it always means a 24 hour period. Also when day is used in the plural it means 24 hours. The dinosaur was created on the sixth day with man. Job 40:15-20 also bears this out. Finally found it lotsmtomread and consider. But looks like everything is lined up for destruction- sure was hoping the church wouldn't see this ...so looks like our prayers will be needed during this time. So looks like all three prophecies in Isaiah,psalms and Ezekiel are playing out to be possibly one large event. Wow, what a time to be alive. Wow, I am learning so much from this. I haven't read the Bible in depth and so I wasn't aware that dinosaurs were created on the same day as man. This does make me curious about all the other animals. Were they all created on the same day?